The Ford Transit Connect takes the office on wheels to a new level. Should have used the GPS to find my way back. Obtained further proof that size of vehicle is inversely proportional to frequency of getting cut off on the freeway. People giving me weird looks. Is it because I'm sitting in a big van in a small parking lot, working at a computer? I transfer the file directly to the office via the network link, and start to get a little nervous about loitering. So I stow the keyboard, switch out of browser mode and hit the road. Just another day at the mobile office. Stow it: Dual sliding doors, 135 cubic feet of cargo space; 52.1 inches of available load height; maximum payload 1,600 pounds. Rear cargo doors, 255-degree opening ($190). If you needed any more evidence that we're in the age of the entrepreneur, the new Ford Transit Connect is it: A compact commercial van developed specifically for small-business owners that can be loaded with just about everything you need to run an office--computer, printer, inventory scanner and more. 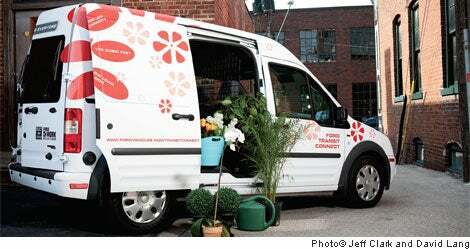 Packages are designed for plumbers and painters, caterers and musicians; my test ride happens to be outfitted for a florist. Bright pink flower graphics adorn the exterior, and the custom racks-and-bins assembly holds all the tools of the trade--bouquets, watering cans, fertilizer . The Connect has been available in Europe since 2003, but this year, Ford decided it was time to introduce a compact commercial vehicle to North America. After the first month, dealers had sold almost all of the stock on the lot, and there's already buzz for an electric version of the van, with a charge range of 100 miles, scheduled for release next year. Its trim size and low platform are big selling points. I drove into a low-ceilinged parking garage with room to spare, breezed down a narrow alley to avoid making the dreaded left onto a major street sans traffic light, and even pulled a couple of fast U-turns without causing a traffic jam. Plus, its compact frame means money saved on parking tickets (no need to double-park this baby). But what would a successful small-business owner think of the Transit Connect? Meet our other test subject: Joe Prior, 25, owner of Joe's Premium Painting , a company that specializes in high-end finish work for commercial and residential properties. Prior is Ford's target customer--hell, he practically built a MacGyver version of the Connect, starting with a 2006 Dodge Ram pickup. A peek into Prior's Dodge reveals a rough, albeit ingenious, construction of metal sheets, hooks and bolts that form a platform for his laptop. When he brings a printer for invoices into the mix, the nest of cables required to power everything borders on the ridiculous. We meet up outside his showroom in Los Alamitos, Calif., and he immediately gives the Connect the once-over, rolling open the dual sliding doors and springing open the split-rear doors, pushing them back until they lock against the sides of the van. "Loading and unloading would be really easy," he says. The payload capacity is equal to his pickup's, but the enclosed space would protect equipment and product samples. Prior is also impressed by the custom racks-and-bins package options. He leafs through the catalog and stops at the Painter option. "That's nice," he says. "It's basically what my storage trailer is for, to keep things organized so we'll be able to find things." Ultimately, what really captures his attention is the Ford Work Solutions, the integrated in-dash computer system (4 GB memory with USB and SD ports, plus wireless keyboard and optional Bluetooth-enabled printer) that provides access to a cellular broadband connection when the engine is on (no worries--you can't use the computer while you're driving). It's Prior's MacGyver setup, but sleeker and more functional. He takes a moment to play with the Connect's touch-screen keypad, which shifts to the wireless keyboard with a quick tap. "I've seen other guys do similar things to what I did for my laptop. It works, but it's one more thing to forget in addition to the tools and materials you have to bring to a job." Connect's Tool Link option uses barcode technology to scan the van's interior for tagged tools on inventory lists--in Prior's eyes, the Connect's sexiest feature. "I would be so much more organized if my secretary could send me information for different jobs from the office so I'd know automatically what tools I did or didn't have," he says. "I'm going through two tanks of gas a week making extra trips to get or replace things. That's an extra $2,500 to $3,500 a year in fuel costs alone." The bottom line, though, is that even though the Transit Connect is reasonably priced (base price is $21,485), for Prior, it falls a few feet short of a purchase. "The size is awkward," he says. "It would be a lot harder to fit everything I need, and I don't always want things locked in a van." The Transit Connect seems ideal for a smaller startup operation, or a sales or franchise fleet. And in fact, the Work Solutions' Crew Chief option is designed to track fleet vehicles in real time. Yes, Big Brother is here: Now the boss can monitor where you are, how long you stay there and how erratically you drove to get there. Idlers, beware. As for reporting from the road, I found myself heading back to the office sooner than expected. The internet was too slow to provide a good browsing experience, and my neck hurt from craning to see the screen from an uncomfortable angle. Still, when Prior finished putting the Transit Connect through its paces and pulled into the parking lot, his thoughts echoed my own: "It drives really well. It's really cool."